Microtubules of the eukaryotic cytoskeleton perform essential and diverse functions and are composed of a heterodimer of alpha and beta tubulins. The genes encoding these microtubule constituents belong to the tubulin superfamily, which is composed of six distinct families. Genes from the alpha, beta and gamma tubulin families are found in all eukaryotes. The alpha and beta tubulins represent the major components of microtubules, while gamma tubulin plays a critical role in the nucleation of microtubule assembly. There are multiple alpha and beta tubulin genes, which are highly conserved among species. 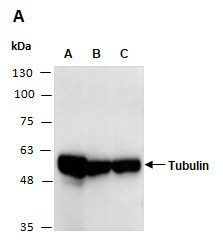 Tubulin A1A encodes alpha tubulin and is highly similar to mouse and rat Tuba1 gene. Mouse monoclonal antibodies were produced by immunizing animals with a GST-fusion protein containing the N-terminal region of human Tubulin A1A. Antibodies were purified by Caprylic Acid- Ammonium Sulfate precipitation. using anti-Tubulin A (N) (M0267-1b) at RT for 2 h.